At a meeting of the Comitatone (big committee) for strategic matters relating to Venice, hosted in Rome on 7 November by the minister for infrastructures, Graziano Delrio, a decision was taken that would keep all but the biggest cruise ships docking in the port of Venice while providing them with a route that would not lead through Venice. “It’s a question of acting swiftly and guaranteeing the key role of the Stazione Marittima [the port in Venice]”, said the president of the Veneto region, Luca Zaia, to La Nuova di Venezia newspaper. The decision aims to address a matter that has become such a scandal that it is one of the reasons why Unesco is threatening to put Venice on its World Heritage in Danger list. 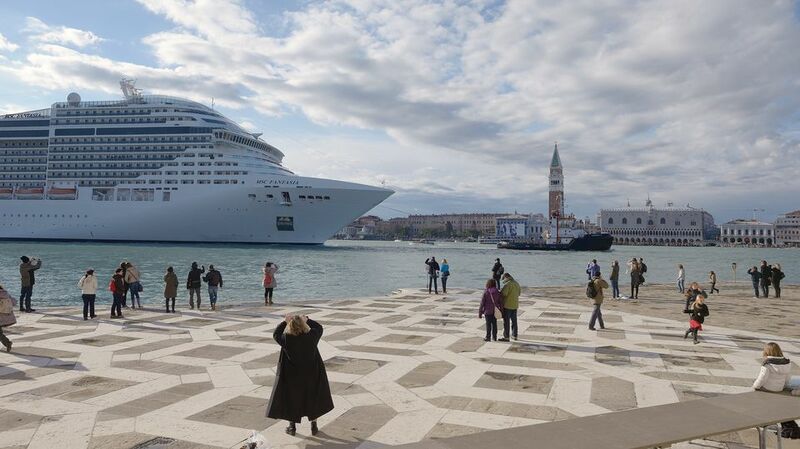 Currently, 500 to 600 ships—a yearly 1,000 to 1,200 entrances and exits—of up to 96,000 gross tonnes enter the lagoon from the Adriatic by the Lido opening to sail through Venice down the Canale della Giudecca and dock in the port of Venice. But the Comitatone has rejected the solution favoured by environmental scientists and some politicians, which is to build a floating port outside the lagoon, from which passengers would be brought into town in smaller boats. The main reason for this is that the proposed solution sacrifices the ecology of the lagoon and potentially, therefore, the physical future of Venice itself to the short-term interests of the port in Venice, which is run by a company Venezia Terminal Passeggeri SpA, in which powerful local and international interests, including the Veneto region, cruise ship companies and the world’s biggest cruise port operators, Global Ports Holding, have shares (see box). 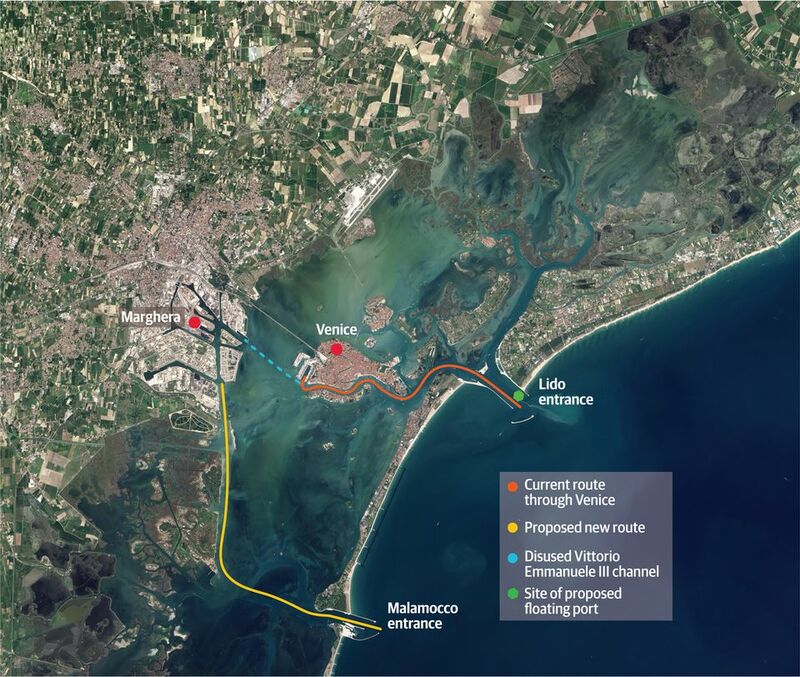 The Comitatone’s memorandum of understanding says that the industrial port of Marghera on the land side of the lagoon will be adapted to take up to three of the biggest (tonnage undefined) cruise ships at a time, which will enter the lagoon by the Malamocco entrance to the south of Venice and sail down the channel excavated in the 1960s for the petrol tankers. Their passengers will be brought to Venice by ferries. But smaller cruise ships (tonnage again undefined) will also enter by Malamocco, follow the same route and then turn right down the Vittorio Emanuele III channel to get to the port in Venice. For this to happen, the disused Vittorio Emanuele III will need to be dredged from its existing depth of 6m to 9m, while the Malamocco-Marghera channel will have to be widened to accommodate the hundreds of extra sailings because industrial and cruise traffic will be competing for space. This will be very damaging. There are numerous peer-reviewed studies (in particular, Fatti e misfatti di idraulica lagunare: la laguna di Venezia dalla diversione dei fiumi alle nuove opere alle bocche di porto, by the Padua university environmental engineer Luigi D’Alpaos, 2010) proving that the deep-dredging carried out since the 1960s has led to loss of lagoon shoreline, mudflats and sandbanks that absorbed the force of the waves, and of sediment from the lagoon bed, leading to its deepening from an average of 40cm to 1.2m. In other words, the lagoon is turning into open sea instead of being the protective buffer around Venice it used to be. At a time when estimates of sea-level rise by 2100, based on the Intergovernmental Panel on Climate Change of 2013, are 140cm, and extreme weather events are multiplying, this demonstrates no concern for the safeguarding of one of the world’s greatest treasures. The shareholders in Venezia Terminal Passeggeri SpA, the commercial company founded in 1997 to run the Stazione Marittima port in Venice, are APVS (53%), Finpax (22.18%), SAVE (22.18%) and the chamber of commerce of Venice, Rovigo, Delta Lagunare (2.64%). APVS was set up by the Venice Port Authority, a public body. Until 2016, it was 65.98% owned by Veneto Sviluppo, set up by the regional government of the Veneto, and Venezia Investimenti, in which Carnival Group, MSC Cruises, Royal Caribbean, Global Ports Holding and Autorità Portuale Venezia Investimenti had shares. Finpax is made up of local companies involved in the port’s activities, while SAVE is the company managing the Venice airport. In May 2016, Veneto Sviluppo exercised its option and acquired the controlling stake in APVS. In August 2016, the Turkey-based cruise operators Global Ports Holding acquired two large stakes, giving it a total of 44.34% of Venezia Terminal Passeggeri; it bought a 48% shareholding in APVS from Veneto Sviluppo via Venezia investimenti, which is now jointly owned in equal shares by Global Ports Holding and Costa Crociere, MSC Cruises and Royal Caribbean; it also bought an 85.85% stake in Finpax.